The County Council has set out its priorities and hopes for the future following the election of a new council in May. 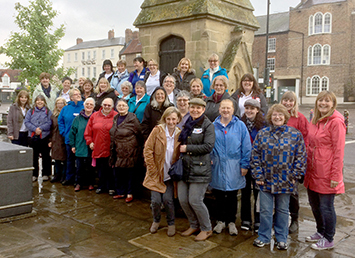 Nominations are rolling in for our community awards - and winning can make a big difference to groups like Thirsk Yarnbombers, above. We’re celebrating the county's strong volunteering culture as part of National Volunteers Week, which runs until 7 June. North Yorkshire Health and Wellbeing Board is celebrating Learning Disabilities Week by launching its Live Well, Live Longer strategy. We and our partners are asking people to give their views on Bring Me Sunshine, the draft dementia strategy for North Yorkshire. We will publish a new strategy this summer in partnership with the NHS to focus on the health and wellbeing of carers. Masham is to have a lift-share scheme, thanks to County Council funding. The scheme is seen as a pilot for other parts of the county. We propose to introduce a permit scheme to improve management of work on the county's roads. Consultation is under way. Fantastic free events for children and their families will be held at libraries across the county for Bookstart Week from 5 to 10 June. This year, more than 95 per cent of parents or carers of primary age children secured their first school preference in North Yorkshire.